Sterling Silver, real Turquoise, Coral, Mother of Pearl, and Jet. 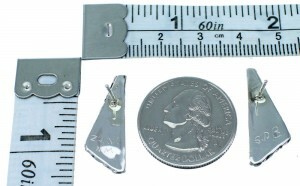 Post earrings measure approximately 1" long and 3/8" at widest point. This lovely pair of earrings is a work of art and has everything you could possibly want from a piece of Native American jewelry! 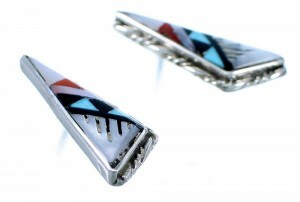 This piece of Native American jewelry is Zuni hand crafted by artist Sylvester Boone, out of genuine sterling silver, along with real multicolor inlay. The inlay consisits of: Turquoise, Coral, Mother of Pearl, and Jet. The inlay is carefully set, while twisted silver accents the earrings for a remarkable finish. 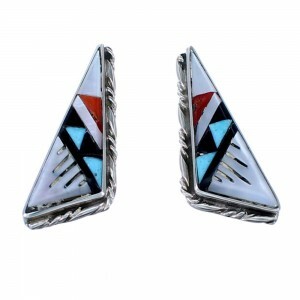 The earrings are signed Zuni and by the artist.